An 11-year-old Bournemouth fan had his wrist broken in two places after being hit by a wayward Cristiano Ronaldo free-kick during Sunday's friendly against Real Madrid. 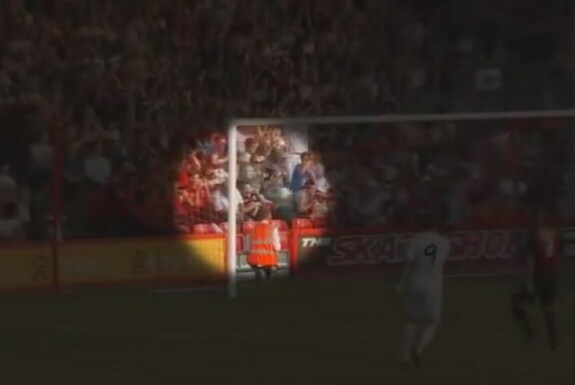 Charlie Sherwood was hit by a powerfully struck, but wayward, free-kick smashed towards goal by Ronaldo just six minutes into the friendly at Dean Court. Despite the pain in his arm, young Charlie stayed until full time of the match which the Spanish giants won 6-0. Afterwards, Charlie was taken to hospital where he underwent an operation which fixed the breaks and left his arm in plaster. "It's one of the most spectacular ways you can get your arm broken," Charlie told Sky News. "I'd have to say I'd prefer doing it this way then just falling out of a tree like my dad did it. "You wouldn't expect this to happen to anybody. If I hadn't put my left hand up, took the brunt of the force on my palm, I'd have ended up with no front teeth." His father Lee, who is also a Bournemouth fan, said: "One minute we were watching Ronaldo stand over the ball and the next it was flying towards Charlie." To ease his pain, Charlie was later handed a signed Madrid jersey and a football signed by the Bournemouth team. Last season, Ronaldo's former Manchester United teammate Wayne Rooney also accidentally broke a fan's wrist at Wolverhampton Wanderers.